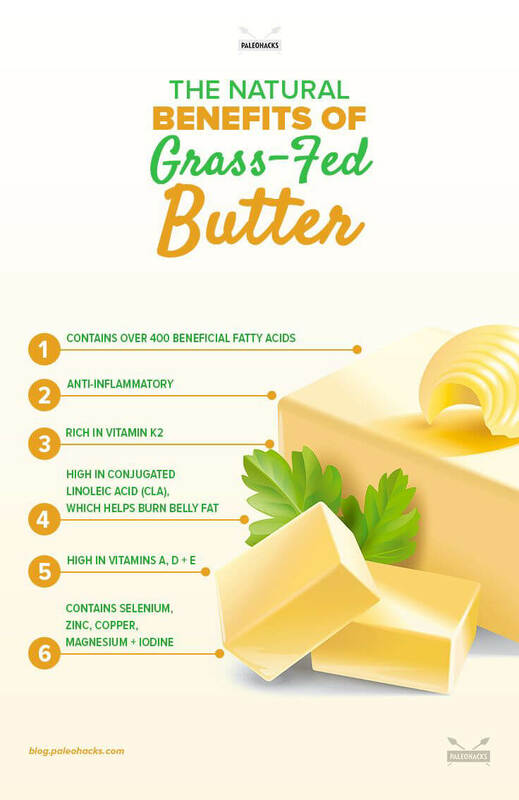 What are the Health benefits of Grass Fed Butter? Is Grass-Fed Butter Really Good For You? The skepticism surrounding the nutritiousness of grass-fed butter has been ubiquitous since time immemorial. What characteristics make this yellow-pile of butter the healthiest food? Let’s find out! When choosing your meat, you are probably extremely careful. People insist on grass-fed beef for a good reason – it is healthier and filled with more nutrients our body can use. The question is – does the same apply to grass-fed butter? The logic would say yes – eating the grass-fed version is like upgrading the basic butter to the next level. Let’s take an in-depth look at why you should seriously consider switching to the grass-fed variant. Unfortunately, we are witnesses of maltreating cows throughout the entire world. Just like humans, these animals’ health depends on their nutrition. If they eat grains and are injected with antibiotics and hormones, it is only natural that they become weak and malnourished. This also affects the quality of the dairy products they are used for, including butter. Now, imagine if you let cows be on their natural way of nutrition – grass. This is a surefire way to optimize the health of the animal and, as a result, receive milk that will contain more nutrients and healthy fats while remaining free of toxins. This gives an answer to the question why grass-fed butter is better than the regular one. Before we continue, let’s mention that you can also use organic ghee. This is an acceptable alternative if you have digestive issues when eating dairy or are intolerant to lactose. Ghee is basically butterfat which means you can safely consume it and it is particularly suitable for cooking at high temperatures. Now that we know the difference, let’s take a look at the health benefits of organic, grass-fed butter. If you having problems to memorize the name of this compound, it is perfectly fine to say CLA as long as you remember its benefits. CLA is a form of fatty acid that has anticancer properties and can help to strengthen your bones. It also plays a part in building your muscles and supporting their strength instead of allowing fat to store. Finally, the anti-inflammatory traits of CLA will help with any sort of inflammation in your body. It can reduce the risk and symptoms of chronic conditions like arthritis or prostatitis. It is vital to mention that organic butter has about five times more CLA than regular butter from cows fed with grains. If you have ever had a wish to learn a thing or two about healthy nutrition, you probably heard about Omega-3s and their importance. You might also know that fatty fish is an important source of Omega-3s and that is true. However, did you know that organic butter can also secure a significant quantity of EPA and DHA for your organism? Omega-3s have multiple ways of boosting your health. They participate in building cell membranes and also have anti-inflammatory characteristics. As such, they boost and prevent both brain and heart health and support the body’s natural inflammatory response against arthritis and other conditions. Butyrate is another component of organic butter that falls into the category of fatty acids. It is known to boost metabolism which can assist you in getting rid of those extra pounds you have been carrying for a while. When it comes to potential benefits, butyrate enhances sensitivity to insulin, optimizes blood glucose and cholesterol levels, and accelerates fat burning. By stimulating the activity of mitochondria, it can also help you convert ingested and stored fats into fuel necessary for the optimal function of your body. Additionally, it also supports gut balance and works on fighting inflammation. This may sound a bit surprising since butter is considered as fat and people have been talking nonsense about damaging effects of fats for a long time now. The truth is that there are healthy and unhealthy fats, pretty much just like any other types of foods. When it comes to organic butter, it has a generous amount of good cholesterol, as well as antioxidants. These are primarily vitamins, such as E, D, A, K2, but also selenium, lecithin, and iodine. The experts confirmed in several studies that consuming dairy fat can decrease the risk of heart attacks and stroke. Did you know why organic butter has that specific yellow color that borders with golden? It has to thank beta-carotene for this vivid color and this compound is available in such generous quantity thanks to the grass-based nutrition of the cows. It has been confirmed that lutein and beta-carotene levels enhanced with proper cow nutrition. As for beta-carotene, once it gets into your body, it gets converted into vitamin A. This nutrient is essential for eye health and vision and it is actually included in numerous health supplements. It also boosts immunity and strengthens bones. We also mentioned lutein because this nutrient has protective properties that can keep your eyes safe from UV rays and blue light. These are the vital reasons why you should consider including organic butter in your nutrition. And if you already switched to the healthy, grass-fed option, we hope that this reminded you and freshened your knowledge of why organic butter is always a better choice than the regular one.